The best answer to your question is to be evaluated by a professional. It is highly advisable to seek a medical professional's advice and care for removing a tattoo, especially on darker skin types. There are other options than PicoSure out there now. For darker skin types we always emphasize the importance of only using a 1064nm wavelength and using lower energy settings to reduce the chance of complications. Your skin color can be safely treated. You need to ensure that the clinic is experienced with tattoo removal. We recommend a medical office based practice rather than a spa. We use the Cutera Enlighten PicoGenesis laser, as it has a good effect on all skin colors. It is important to wait between treatments (8+) weeks to promote good skin healing and to condition the skin between treatments. 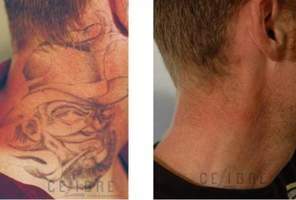 Typically the first treatment is with nanosecond wavelength to break up larger ink molecules, and then as the tattoo fades use the picosecond wavelength. Again, experience is the key to successful removal.